Mumbai: The Delhi High Court in a judgement on Friday ruled that the selection process for the Indian kabaddi teams (men's and women's) for the 2018 Asian Games in Jakarta was as an "eyewash" and ordered the Amateur Kabaddi Federation of India (AKFI) to conduct a fair selection process that is in accordance to the National Sports Code of India. However, with the 2018 Asian Games less than a fortnight away, the court accepted concerns put forward by the Indian Olympic Association (IOA) that any changes to the team at this juncture might not be possible and, more importantly, could jeopardise the kabaddi teams' participation in the Jakarta event. However, stressing on the need for transparency in selection process, the court, in view of the assertions made in the writ petition filed by former kabaddi players C Honnappa Gowda and S Rajrathanam, seeking appointment of a committee to oversee the selection of the Indian kabaddi teams for the Asian Games, ordered that the selected players should not be given any benefits in the nature of jobs, cash prizes etc that may come with winning a medal or representing the country at the Asiad, until they prove their merit in trial games that will take place after the Asian Games. The games will see both Indian kabaddi sides face teams that will comprise of the players perceived good enough to be a part of the Indian kabaddi teams, and those perceived to be unfairly denied an opportunity to represent the country at Asian Games. These teams will be picked by a panel of three selectors under the observation of Ravinder Kaur who has been appointed as the Observer of the selection process involving the trial games. The three selectors will be determined by the Secretary of the Ministry of Youth Affairs and Sports. The trial games are scheduled for 15 September and will be held at Thyagaraj Sports Complex in New Delhi. The entire process will be videographed and its copy will be placed before the court. On basis of the video evidence and the observations of the panel, the selected players be cleared for rewards or blocked from receiving it. However, the exact process that the panel would use to identify the players that may have been selected by unfair means remains unclear. Bharat Nagar, the petitioners' lawyer, revealed to Firstpost that his clients have submitted a list of players from both teams that they suspect of being selected by unfair means. But whether or not that is taken into consideration by the panel while preparing the final report remains to be seen. If the court identifies certain players that were unfairly denied opportunity to represent their country, then it will be interesting to see if it passes an order to compensate them and if it does, then how is that executed. "We feared that the selection of the Indian kabaddi teams for the Asian Games could be influenced by the Gehlot family, which has been holding power in the sport for almost three decades. There have been many malpractices involved during team selections in the past and to guard against that we wanted the formation of a selection committee that would oversee the selections and ensure the best players from the country are picked in the side," Gowda, an Arjuna Award-winning kabaddi player, told Firstpost over the phone, citing reasons for filing the petition. The petitioners also accused the AKFI of antedating the selection proceedings with the knowledge of a pending judgement in the Supreme Court with the help of the Indian Olympic Association (IOA) who according to the court's judgement fabricated e-mails to legitimise the antedating of the selection proceedings. The petitioners pointed at the statements made by the AKFI General Secretary Deoraj Chaturvedi to the press and the contrasting nature of the AKFI announcement that came within few hours of the statement as a sign of complete lack of transparency in the body's operations. 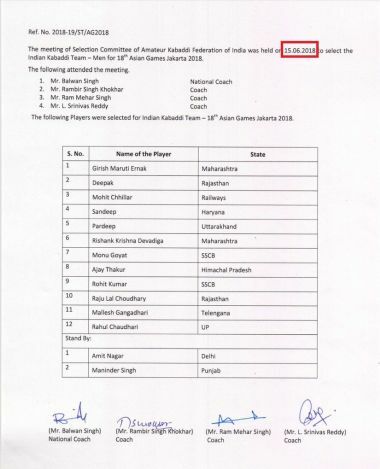 Document about India's men's kabaddi team for Asian Games posted on AKFI's website on 7 July 2018. On 7 July, Chaturvedi, in an interview with The Hindustan Times, had said that the final selection of the Indian teams for the Asian Games will take place during the final camp commencing from 15 July. However, contrary to his claims, the national kabaddi body announced the men's and women's teams for the Asian Games on their website the same day, claiming the selection processes for the two teams had already concluded on 15 June and 17 June respectively. The team that was announced had a few surprises. Cover defender Surjeet Singh, who played almost every minute of India's matches at the Kabaddi Masters tournament that was held in Dubai in June, was dropped from the side without a concrete reason. Left corner Surender Nada, who has been regular feature in the national side for the past two years, was also left out. Sources close to a member of the selection committee had told Firstpost last month that Nada or Surjeet had no injuries and had, in fact, been dropped from the team. Gowda felt right corner defender from Rajasthan, Raju Lal Choudhary, and all-rounder Gangadhari Mallesh didn't warrant a place in the national side. "It's clear to everyone that Raju Lal Choudhary and Gangadhari Mallesh haven't done enough to be in the Indian team. Mallesh wasn't even in the team for the Kabaddi Masters or the Asian Championships last year, but he is still selected ahead of so many deserving players," Gowda alleged. Choudhary barely made a mark during the Kabaddi Masters, where he played fewer minutes and scored lesser points than both Nada and Surjeet but still managed to retain his place ahead of them. The performances in the domestic competitions of Choudhary and Mallesh also do little to make a case for their presence in the national team. There was a surprise inclusion in the women's team as well. A player — who Gowda refused to name — has allegedly not been in the national picture for over a decade but was picked to the team for the Jakarta Games after a gap of 11 years. The petitioners' lawyer Bharat Nagar levelled allegations of corruption against high-ranking officials of AKFI. "It's a simple deal. When players win medals in big international events, the state government rewards them with cash prizes, jobs and other benefits. A few players who aren't deserving of a place in the side are named with a deal that they will share the amount with authorities who let them get in. That's the only reason why these selections are made," Nagar told Firstpost over the phone. The corruption in the AKFI was laid bare when the Delhi HC in another judgement on Friday removed President Mridul Bhadauria from office after declaring that no valid elections were held to place Bhadauria in the post. Her husband and President of the International Kabaddi Federation, Janardan Singh Gehlot, who had headed the national federation for 28 years before his wife took over, was removed as Life President, as a person who has served more than three terms cannot be re-elected. Sanat Kaul, an IPS Officer has been appointed as Administrator to take control of AKFI till further orders. So as the Indian teams prepare to continue their golden streaks at the Asian Games, the controversy surrounding the sport and its federation does little help. 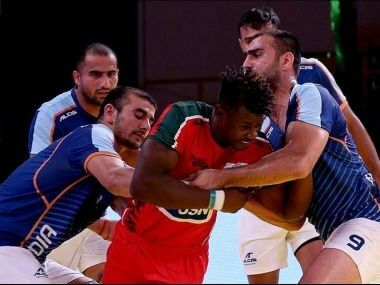 With the likes of Iran, Pakistan and South Korea likely to present a stronger challenge as compared to the recently-concluded Kabaddi Masters, the Indian team will have to be at their best to continue their dominance in the continent. With a trial game to prove their merit awaiting them after the Asian Games, maintaining a positive mindset will be harder than usual for the players. Tricky times await kabaddi's world-beaters.